Yesterday, I introduced my students to the new-to-me strategy of multiplying using a ratio table. 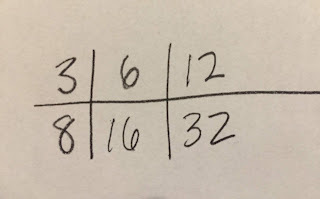 We did a few whole number examples together, adding this strategy to our multiplication toolboxes along with the standard algorithm (some can use this strategy, but not all...not YET), partial products, and area model. I turned them loose with pictures of oranges I took one day at the grocery store. Some oranges were $.79 each, others were $.55 each, and there were the above bags of 8 oranges that were $2.99 per bag. Their task was to find out how much each option would cost in order to buy an orange for each of the 27 students in the class. 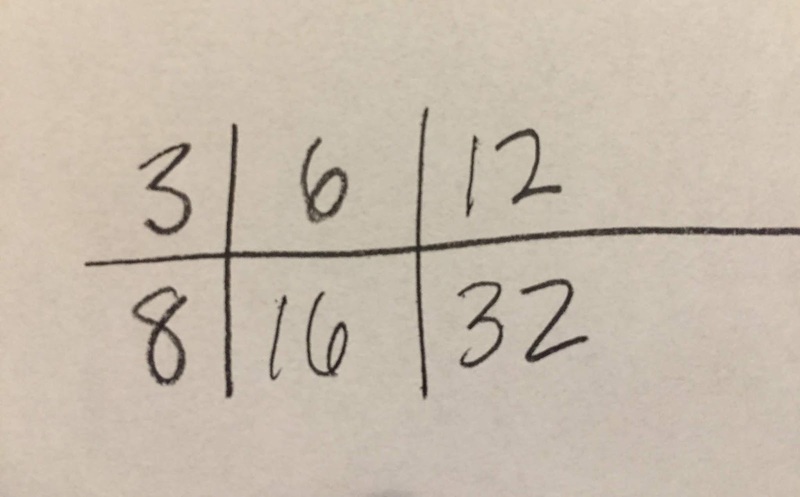 When we gathered at the end of the period to share answers and strategies, I was floored by one of my mathematician's use of the brand new ratio table strategy. First of all, he used $3.00 rather than $2.99, knowing he could take off those extra pennies once he had his solution. Smart! He started his ratio table the way I'd modeled, with his first known information. 3:8 (dollars:oranges). He doubled until he got to 32 oranges and $12. We all assumed you'd just have to buy 5 extra oranges. But what happened next blew us all away. He showed us that by HALVING instead of doubling, he could get us within one orange (and a half a penny) of the 27 oranges. It's not very often that a teacher gets to witness what happens when she hands a learner a tool and they take it to the next level all on their own. It was a geeky-good day in math yesterday! Wow! I had to reread this several times. Kudos to your brilliant mathematicians. Happy 13th Blog Birthday to Us!